What a wonderful spring and summer we’ve had! The rain continued to fall late into June and the temperatures have been moderate allowing the bees an extended nectar gathering time. 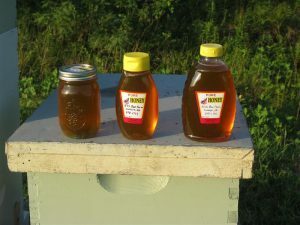 We were still putting on additional honey supers at a time when normally the season would have been over. While the early honey crop is a wonderful light color and taste, the fall crop was surprisingly large and is very creamy. See the products and services page for bottle sizes, shapes, and prices.